Do you like baking your own cookies? Personalized cookies are great for special events such as birthday party and baby shower. But often time it’s hard to find the shape of cookie cutters we are looking for. Or it might be a waste of money to buy one just for one time use. 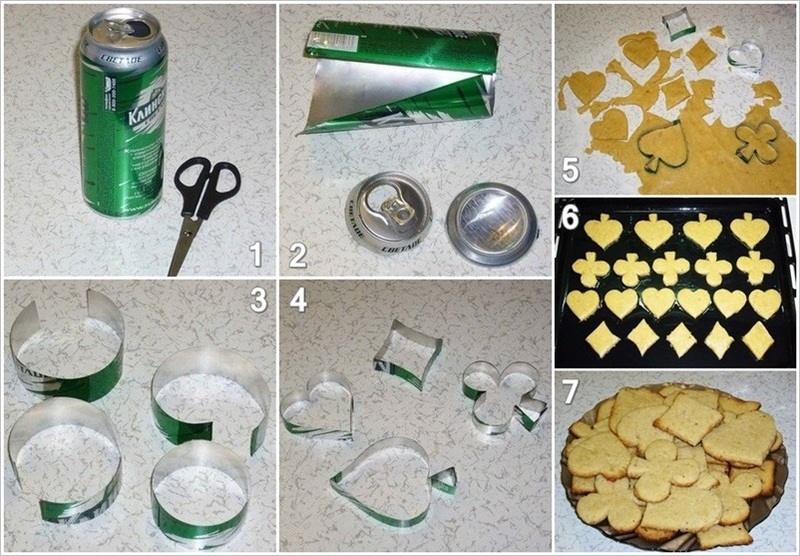 A perfect solution would be to make your own custom-designed cookie cutter. It only takes a little bit of time and a soda can! It’s also a nice way to recycle soda cans. Let’s get started. Clean the empty soda can thoroughly. Wear the work gloves and carefully cut the top and bottom of the soda can off. You need to be very careful with the sharp aluminum edges. Cut out strips from the soda can. Use sandpaper to smooth the edges of the strips. Print or draw your desired shapes of cookie cutters on a piece of paper. Use the templates to cut out these shapes on the cardboard. Wrap the strips around the cardboard templates. Arrange and bend the strips in order to take the shapes and secure the ends with food safe adhesive. Now you are ready to use these personalized cookie cutters and your favorite cookie recipe to make some special cookies for any events. Enjoy!